and a world to carry on. For many who lived through the 60's and early 70's, Laura Nyro needs no introduction. Even for those for whom her name has faded, or for whom it was never on the radar screen, a few bars of one of her many well-known songs likely will prompt recognition. Starting with "And When I Die," a song she sold to Peter, Paul and Mary at the age of 17 (later popularized by Blood, Sweat and Tears), her music became standards of the period, including songs like "Wedding Bell Blues" and "Stoned Soul Picnic" (The Fifth Dimension), "Stoney End" (Streisand) and the song from which this show takes its title, "Eli's Comin'" (Three Dog Night). Although her own sensibilities perhaps kept her from becoming as familiar as her music -- Robert Christgau of the Village Voice remarked that "[s]he was born 150 years too late" -- she continued to develop a body of work until her untimely death in 1997. She has also influenced a generation -- or more -- of female singer/songwriters who have followed in her footsteps. This show, described as an evening of music-theater, is in the nature of an appreciation. It is not biographical, nor is it a "book" musical. It's also more than a simple concert (even though it works its way through over 20 of her songs in a little over an hour). Preferring to think of it as a new kind of theater, its creators eschew the label "revue" (although I think it's a description that's fairly apt). There are no spoken words; its story, such as it is, is told through Nyro's lyrics. 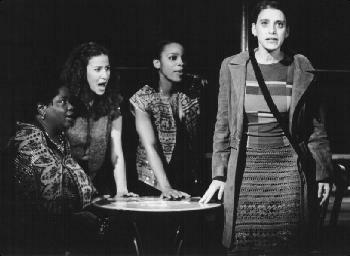 The goal, it seems, is to embody the themes of Nyro's music dramatically, traced through a central figure, Emmie (Judy Kuhn) -- her name derived from that of one of Nyro's songs, included in the show -- as she inhabits New York: its subway, its streets, its puzzles, its temptations. Emmie is accompanied on this "journey" by three other women, described simply as The Young Girl (Mandy Gonzales), The Woman (Anika Noni Rose) and The Mother (Ronnell Bey). Also lurking about is a devilish character who occasionally dances up a storm, Wilson Jermaine Heredia. He's known as Captain, an obvious reference to the song, "Captain Saint Lucifer". What we are left with -- and in my view the best way to view the show -- is simply a journey through Nyro's songs imbued, as they are here, by the New York street sense that is critical to the development of her music. Newcomers to her music will get a good feel for her oeuvre; fans will get to revisit her work. I would guess the latter would constitute the lion's share of any fan base this show develops. The four women in the cast offer a progession of styles. Kuhn, clearly intended as the star, has the most conventional musical theater pedigree. With a pleasant, clear voice, she gives a fresh gloss to songs like "New York Tendaberry" and the Streisand staple, "Stoney End". The biggest find in the group is the strong-voiced Anika Noni Rose, who dazzles us with expressive R&B renditions of "Buy & Sell&, "The Confession" and "Emmie". Ronnell Bey embellishes her soulful singing with a great deal of humor, making her an audience favorite in her parts of "Luckie" and "Sweet Blindness". Mandy Gonzales is given a lot less to do than her colleagues; "Captain Saint Lucifer" is her only real exposure. The show is at its best when director/co-creator Diane Paulus finds a context in which to stage songs, notably "Eli's Comin'" in which we find Kuhn going to a fortune teller (Bey), and "Sweet Blindness" where a glittery bottle of wine is all it takes to coax nice performances out of all four women, and especially Ms. Bey. We can only wish there had been more of these numbers. Perhaps its inevitable that a show based on the work of a feminist songwriter sends the only male in the cast to the margins, but it's a shame that we don't get to enjoy much at all of the glorious Tony-winner Wilson Jermaine Heredia (best known for creating the role of Angel in the original Broadway cast of Rent). His involvement here is nominal at best. The on-stage band delivers strong support for Diedre Murray's arrangements which shed new light on some of Nyro's songs that have become so closely identified with the unique "classic" versions. This is, alas, another show in which the band "sounds" better than the singers, the latter hampered by incomprehensible over-miking in a space that ought to require none. For Nyro-philes, Eli's Comin' may be a must-see. For everyone else, it's a good chance to get to know the work of one of the seminal figures in music in the last 30-odd years, if they set aside all the clutter. Mon - Sat @8; Sat @3; $15 - $49.